Web 2.0 has brought a lot of different personalities forward. What do they think of the current trends, technologies and potential for their ventures in East-Asia? Web2Asia lets you discover their point of view through interviews with some of today's most interesting internet entrepreneurs active in the Middle Kingdom, the Land of the Rising Sun and the Land of the Morning Calm. This time we spoke with Jun Lin, Founder & CEO of sayjoy.com, an online video editing site. Jun Lin started to develop the website last year when he realized that there was no simple and efficient tool to easily create short videos from photos. 1. Hey, could you please introduce yourself and your project www.sayjoy.com? My name is Jun Lin and I graduated from university in 1994 and since then have worked in the IT, fast moving consumer goods (FMCG) and telecommunications industry. I also gained experience in the field of technology, market research and marketing. In 2006 I founded my first internet project, which is sayjoy.com. Sayjoy.com is an online video editing site. Its main function is to compile photos, videos and music into a narrative with personal video sets. Videos are created as a WMV file, which also can be downloaded and saved. You can play them on your PC, but also using a DVD player. The video files can also be converted to 3GP and MPEG4 files which are suitable for handheld devices like mobiles and PSPs. The service can be used without having to install any software on your PC and the handling is very simple. 2. When was sayjoy.com launched? How does the site differ from services like jumpcut.com? What are the tailored features that fit the tastes and interests of Chinese users? Since the second half of 2006 our R&D Team has worked on the website, but the idea to establish this website was already born at the beginning of 2005. The idea was triggered by my own personal needs. I became a father in 2005 and was delighted and excited and took many pictures of my daughter. But I experienced that the majority of the existing client software available for editing pictures had some deficiencies. Most software is designed for professionals and very complicated to use. Furthermore, the installation requires several hundred megabytes of hard drive capacity and the installation itself is often very cumbersome. Based on that experience, I wanted to develop an online service providing video editing software to avoid the aforementioned problems. In June 2006 I met Xiao-Jun Hu, a teacher at Zhejiang University. After a technical analysis of the project we agreed that this service could be realized and we started developing sayjoy.com. After a period of six months we came up with the first beta version for on-line testing in March 2007, providing the core functions for video editing. At the same time we also discovered jumpcut.com on the web, which provided the same basic functions as sayjoy.com. After the online-testing we closed the site and did a large revision and upgrading. We not only modified the service, but also upgraded to the latest flash technology (AS3 version). The revision and upgrading of the site was done taking into account the actual needs of the users in China and also the current situation of China's internet: 1) the demand for online editing of digital videos (DV) is not very strong in China; users are more interested in online-editing of photos at the moment; 2) China's internet is too slow and does not support services like online-editing of DV; 3) as the flash AS2 version has some inherent technical problems (memory consumption, CPU occupation, etc.) we have restricted the number of functions to provide a smooth service. The upgrade of the website also included a new feature - Cool Head Zone at http://kutou.sayjoy.com. The user uploads a photo and our website generates a small video clip, which is essentially a moving avatar with facial expressions. When we added this feature we considered entering the mobile phone application market, but for various reasons no operator was willing to cooperate. Now, we are considering implanting advertising into the application and we continue to seek suitable partners. 3. How is the site perceived by the users? How many members do you already have and what is your target for this year? We haven't launched any major marketing activities for our website yet. The current users mainly got to know our site through a number of promotional articles in forums, but also word of mouth is contributing to the number. Due to the small scale promotion activities and the short time we are officially online the number of users is relatively small at the moment. We have 40,000 active users of which about 5,300 made use of the VIP service which requires payment. At present, our website is still in the market due to the services provided by an incubator. As we are at an early stage, it is very difficult to formulate clear and precise objectives. However, we still have our priorities - to constantly improve our website and at the same time to focus on establishing partnerships and providing our technology platform in order to generate income to support our online site operators. 4. Do you plan to expand your service to English and other languages? When can we expect the first translated site to be up? What are your expansion plans? This year, we plan to attempt moving into some overseas markets. In this regard, we have also carried out some preliminary preparations. For example, in May we will launch a flash AIR application: Users can use their own pc (no internet and upload required) to use all existing services of our website. We firstly considered the launch of an English version of the website. However, we lack experience regarding the operation in foreign markets. In this respect we have contacted a number of potential partners. The ultimate versions for foreign markets will be decided on in accordance with our ultimate partners. 5. 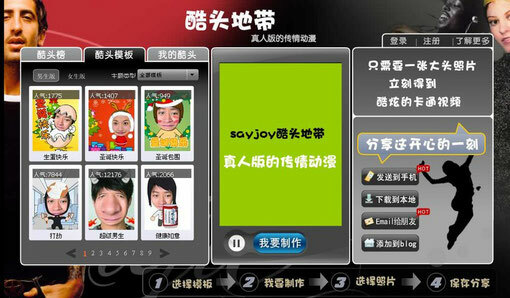 Sayjoy.com is specifically designed for the Chinese user. Would the expansion to other markets require a redesign to be successful? Our website is indeed customized for the Chinese user, but due to the technical architecture it is very flexible. Technical reserves are relatively abundant. Once we have selected the right partner we can address the market very rapidly with new product features and adjustments. 6. According to your experience, how important is the localization of sites and services when tapping foreign markets? In foreign markets localization is necessary. Only localization can really help establish a good image in the local market. Localization is the only possible option for international enterprises, but at the same time the enterprises need to maintain their core positioning. For instance, we see ourselves as an online video editing site: users can compile their photos, videos and music into a narrative and store it in a personal video collection. We hope that once the users have pictures they want to edit, they first think of our website. The produced videos can be used for blogs, space, TV, mobiles, etc. On this basis, we develop a fully localized version of our site. The most important factor at this stage is to provide template designs that address the needs and preferences of the local population. This will be a key success factor when entering a totally new market. 7. What can we expect from sayjoy.com in 2008? Which new features and services do you plan to launch? We will strive to gain a certain visibility in the Chinese market in 2008. We hope to form strategic alliances with some of the large domestic blog and space websites. We also want to gain and accumulate some experience in the English speaking market so that we can try our best to complete the first round of financing. This year, we will launch major AIR applications that allow PC users to access our website seamlessly and integrate the Cool Head Zone into our existing applications. We also consider upgrading the Cool Head Zone to 3D and to add some other new features.